November 29, 2012 / P.J. There were some technical difficulties with the lights on the soccer field coming on late, so I killed some time talking to Kinetic honcho T.J. Cruz, who introduced me to Brathwaite. I was immediately impressed with how down to earth and approachable he was, and also at how — once the lights came on — he was out on the field helping set up equipment for the clinic. He was hands-on from the get-go. This demeanor was also present with Feldberg and Locastro, who, despite their reputations for on-course fire and emotion, connected well with the players in attendance. Whether it was little jokes to people who were filming the clinic on their camera phones, or taking time to work one-on-one with the two youngsters in the crowd of 35, both players were much more human than people sometimes give them credit for. You could tell they genuinely wanted to be there, rather than just phoning it in to collect some easy cash. I was also interested in the players’ teaching styles and how different they were. 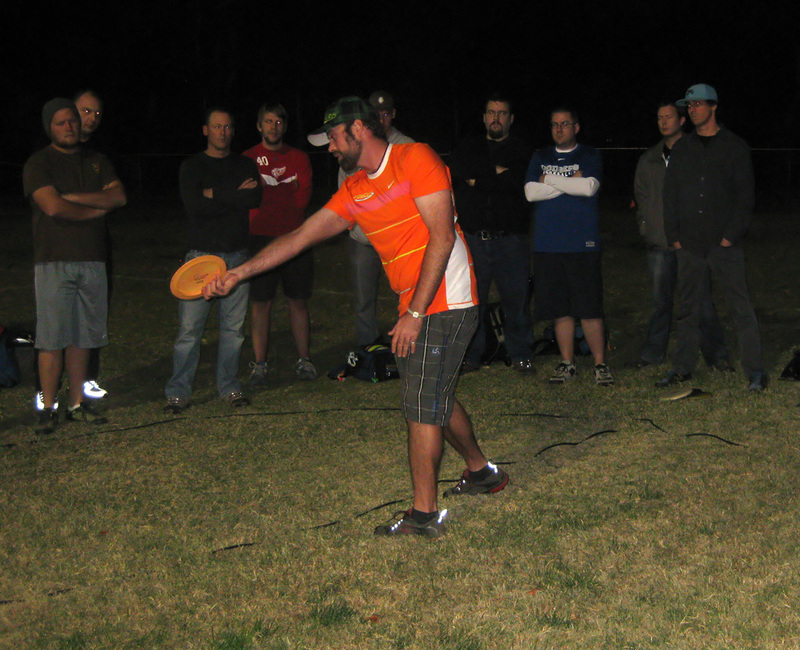 Feldberg, as a seasoned veteran, was much more technical as he explained disc golf in terms of anatomy and geometry. Locastro, as a younger player, seemed to still be finding his rhythm as a teacher and separating technique from natural ability. That is not to say he was not good at it, but you could tell that he had not been doing it for as long as Feldberg. Because I knew the least about Brathwaite, though, I found he impressed me the most. He seemed to know how to take the temperature, if you will, of those in attendance, interjecting at the right time when it seemed like advice or technique might be flying over people’s heads, then distilling it to a simpler form. He was an important cog in bridging the gap between Feldberg and Locastro’s distinct styles, and it was apparent that he understood that people become easily overwhelmed with the information overload. And information overload it was. I found myself, at various points throughout the clinic, just trying to take tiny pieces and store them in the back of my head for future use. For example, I don’t remember all of Feldberg’s in-depth analysis, but he really drove home the idea of adjusting your stance on the tee to match your intended shot. He placed a line down the center of the field, using it to represent your axis for a flat, straight shot off the tee. 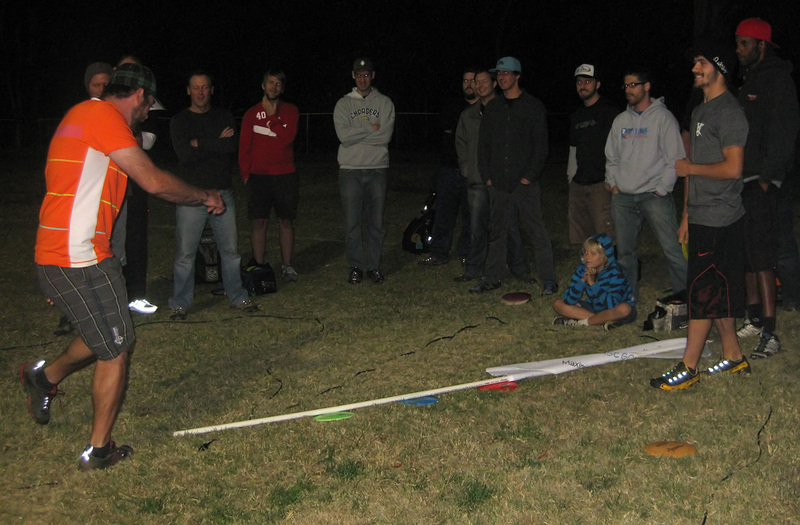 He then would talk about standing more on one side of the line or the other for a hyzer or anhyzer. Another useful piece from Feldberg included thinking about your release point and follow-through on a shot as a mirror image. So, for a hyzer, to start with the disc low and away from your body, then finishing up a closer. It made a lot of sense, and it is something I have tried (with marginal success) incorporating into my game. From Locastro, the most interesting part I took away was that he advocated finding discs in three different stability ranges — overstable, stable, and understable — that you could use for a single release style, rather than having to work one disc on three lines. I think I was intrigued by this because I expected a pro to talk about making a disc bend to your will, rather than letting the disc do the work for you. My bag already follows this theory, but I was surprised to see it worked for a professional player, too. Brathwaite’s most useful tips came during the putting section of the clinic. In fact, this is where I have tried to employ most of what I took from the night, as putting — like many others — is my weakness (OK, that and long drives, but I digress). He talked about adjusting your stance so that you block the weak side of the basket from your view. So, for a right-handed player, your stance would make it to where you would not see the right side of the basket, leaving only the center and left to aim toward. While this adjustment in stance has been tough to get used to, his other useful concept was one of those “a-ha!” moments for me. He called it “hand to the eye,” and said that, when trying to aim your putt so that it hits its apex and is on its descent when it hits chains, it is important to bring your hand all the way up to your eye when you release. This way, you see everything, much like when trying to hit a baseball. I tended to release my putts from hip-level before, but since trying to adjust to this idea, I have improved some in my accuracy. And while there were many more points that were covered, I certainly don’t remember them. But I think that is to be expected from these pro clinics. 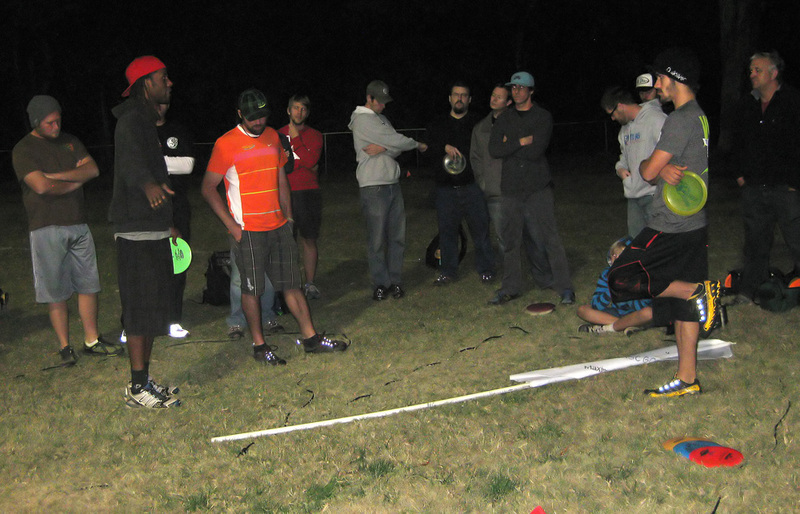 I was happy to absorb a couple of key points, while also seeing how well these players connected with fellow disc golfers. That was the real impression I was left with. While Fedlberg, Locastro, and Brathwaite are all professionals, they are just regular guys out there playing the sport we all enjoy. For that night, we were all on the same level, and I have no doubt that everyone — including these pros — took something from it. 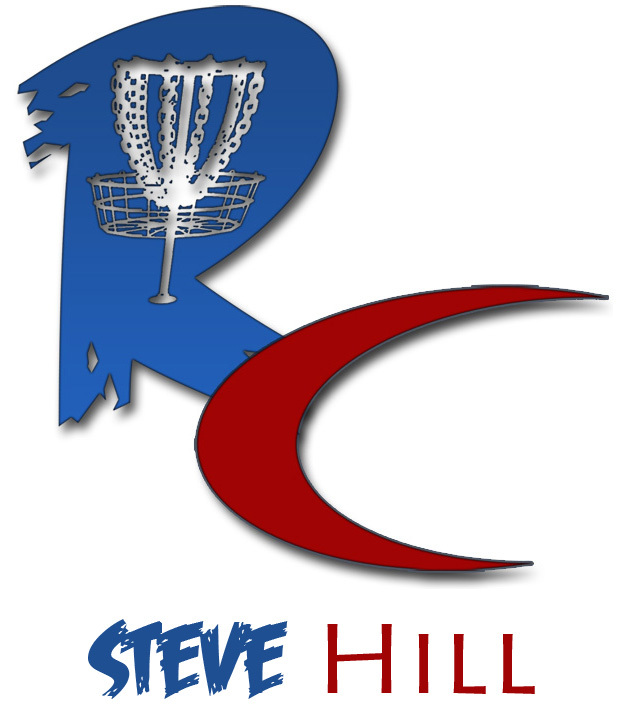 Steve Hill is the associate editor for Rattling Chains. Contact him at steve [at] rattlingchains.com and follow him on Twitter @OneMileMore. Taking something from any clinic, workshop, etc., even if it just one thing is always worth the cost. Sounds like you definitely got your money’s worth and then some! Not only that, but, you communicated what you learned well. Thanks. I certainly hope they put this on you tube soon. I’d really like to see what they have to say. I have never been to a player clinic, but I would definitely like to read more about what Dave Feldberg had to say about adjusting your stance on the tee to match your intended shot. Great article! Hey, thanks for passing along what you heard. Can you clarify what you meant by blocking the weak side of the basket on putting? Putting RH, I tend to get many more chain outs/ deflections from the left side (as the disc is falling left as it approaches the basket.) I can’t see wanting to aim my putts more left?!? That being said, I am a terrible putter, so maybe I am missing something.